The CC Skywave is the latest travel portable radio by C. Crane company. 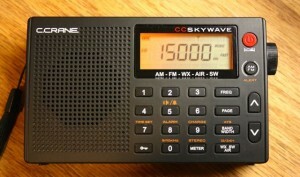 The CC Skywave features: AM (medium wave), FM, Shortwave, NOAA Weather Radio and the AIR band (for airport communications reception). We recently reviewed the CC Skywave on the SWLing Post: click here to view the review. This entry was posted in C Crane, Portable, Portables and tagged C. Crane, C. Crane CC Skywave, CC Skywave. Bookmark the permalink.